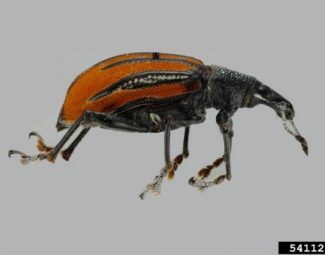 Citrus Root Weevil is native to the Carribean area. It has established in Florida and has been quarantined to prevent spread of infestation in California. Is also a quarantine pest in Texas. Has a broad host range of at least 270 plant species that includes: citrus, peanut, vegetables, potatoes, sweet potatoes, papaya, guava, mahogany, sorghum, corn, strawberries, sugarcane and various ornamentals. Larval stage feeds on roots, which increases vulnerability of root systems to Phytopthora as well as other soil borne diseases. Adults create semi-circular feeding pattern on edges of leaves similar to Fuller rose beetle. Prefer new growth. Plants may not show signs of decline such as wilting, yellowing and/or defoliation until roots suffer severe damage. Trees planted in poorly drained soils are especially vulnerable to infestation. Peak adult populations appear to happen in Florida during late May through June as temperatures and soil moisture rise. The use of aggregation pheromone for feeding and mating is suspected, but none has been identified as of yet. Eggs… (7-10 Days) .04 in. White and oblong. Found in layered groups of 30-260 between the protection of leaves folded together by adhesive material secreted by female. Larva… (8-15 months) .05-1 in. 10-11 instars. White with brown head. C-shaped. They immediately drop to ground upon egg hatch. Young larva cannot burrow into dry soil. Small larva feed on fibrous roots; larger larva bore into larger root parts. Instars 3-9 are most damaging feeders. Capable of girdling the root crown. 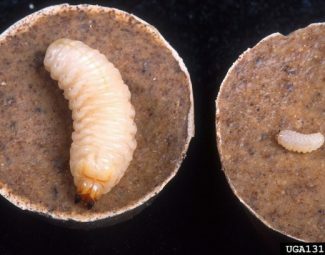 Pupa… (15-30 Days) Pupate in soil. After metamorphosis, emerge from soil as adult. Adult… (135-147 Days) 3/8-3/4 in. long. Coloration is variable and includes black, gray, yellow, and orange. Female can lay up to 5000 eggs. 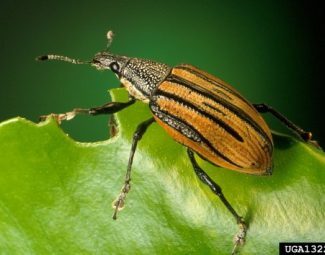 Weevils are most active during dusk and dawn hours. They can fly short distances, but normally very sedentary and feign death when disturbed. 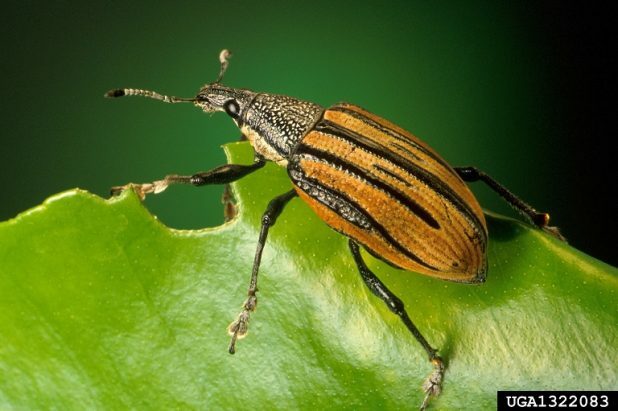 The adult Citrus Root Weevil feeds along edges of leaves and create semi-circular patterns. It prefers new growth for feeding. Fruits and tubers may also be fed on. Feeding damage may be accompanied by presence of frass. Monitor plants for semi-circular feeding patterns on the edges of new leaves, frass and the presence of adult weevils in the areas where feeding damage is observed. Place a drop cloth underneath trees and shake to dislodge adults. This pest is subject to quarantine in Texas and suspected specimens should be submitted to government authorities for proper identification. Examine leaves that appear to be folded or stuck together for presence of eggs. Dig up roots on plants showing signs of infestation and examine for presence of larva. Adults can be sampled using Tedders traps. Parasitic nematode Steinernema riobravis. These nematodes require sandy to loamy soils, maintenance of adequate moisture, and protection from UV exposure. 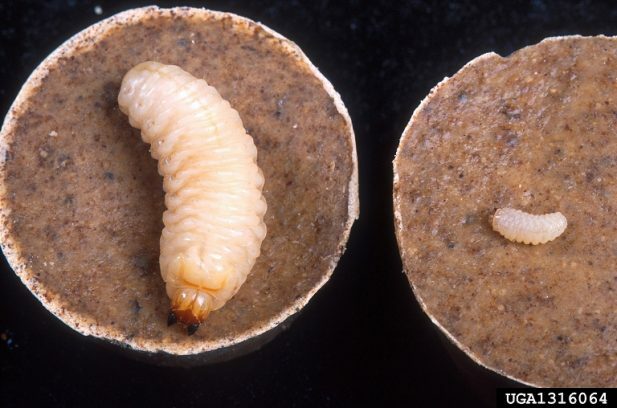 Care should be taken to avoid over-application of soil moisture for nematode maintenance due to potential for Phytopthora proliferation associated with root weevil feeding. Several general predators are known to feed on Diaprepes: predatory stink bugs, Euthyrhynchus floridanus, and the Regal Jumping Spider Phidippus regius. Ants are predators of eggs, but larva produce a chemical that is repellent to ants. Avoid over-watering, especially in poorly drained soils, to minimize potential for Phytopthora root infection. Use root stocks and varieties that have been identified as being Phytopthora resistant. Thoroughly clean equipment after use in infested areas before moving to unquarantined areas. Grafton-Cradwell, Elizabeth E., et. al. 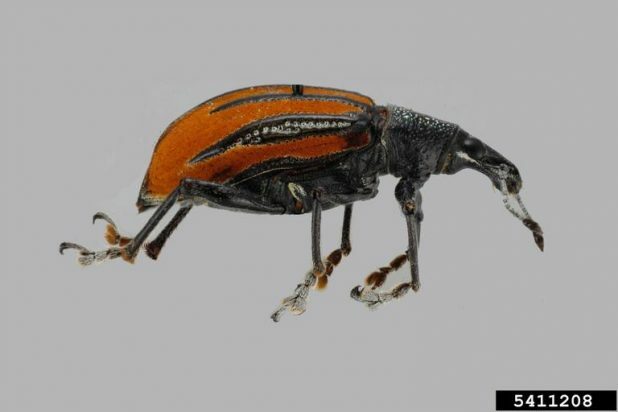 Diaprepes Root Weevil, Publication 8131, University of California Division of Agriculture and Natural Resources. 2004. (Adult coloration, host plants, distribution, sampling, life cycle, symptoms, effect of poorly drained soils).